H. van Lente et al. Recent years have witnessed a remarkable proliferation of activities related to nanoscience and emerging technologies. Exploratory research has expanded to high-tech innovation, national investment has expanded to global collaboration, and interest in the social, ethical, and philosophical dimensions of the molecular sciences has expanded to issues of policy, education, and governance. 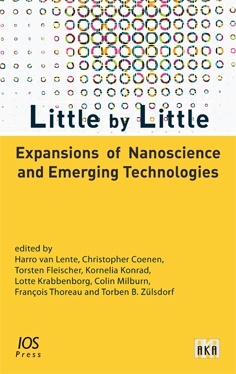 "Little by Little: Expansions of Nanoscience and Emerging Technologies" traces these developments by attending to the diversification of cultural meanings, the engagement of various publics, the transformation of innovation regimes, and the broadening of responsibilities around new technologies. Bringing together contributions and perspectives from experts in the social sciences, the humanities, and the natural sciences, along with incisive reports from experts in public ou-treach, science education, and technology policy, "Little by Little" showcases ongoing research activities of the vibrant, multidisciplinary community of S.NET, the Society for the Study of Nanoscience and Emerging Technologies.